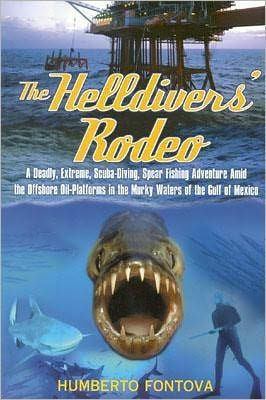 After reading Helldivers’ Rodeo in sixth grade, I had always dreamed of diving Louisiana and its oil rigs. Also, I was fascinated by my best friend’s adventures when he went there every summer to commercial fish with his father, returning with big fish tails of his own. I promised myself I would get there one day—almost 15 years later an opportunity presented itself. 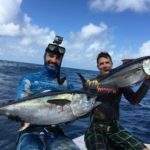 I did not to return to the South Pacific to work in Kingdom of Tonga after two consecutive seasons, the young local guides working with Spearfishing Tonga now have all the experience they need to run the operation on their own. I will say I miss the whales, the ridiculously clear blue water, and the great people of the “Friendly Islands” but as one door closes another one opens. During this newly acquired time I went to visit my newborn nephew. 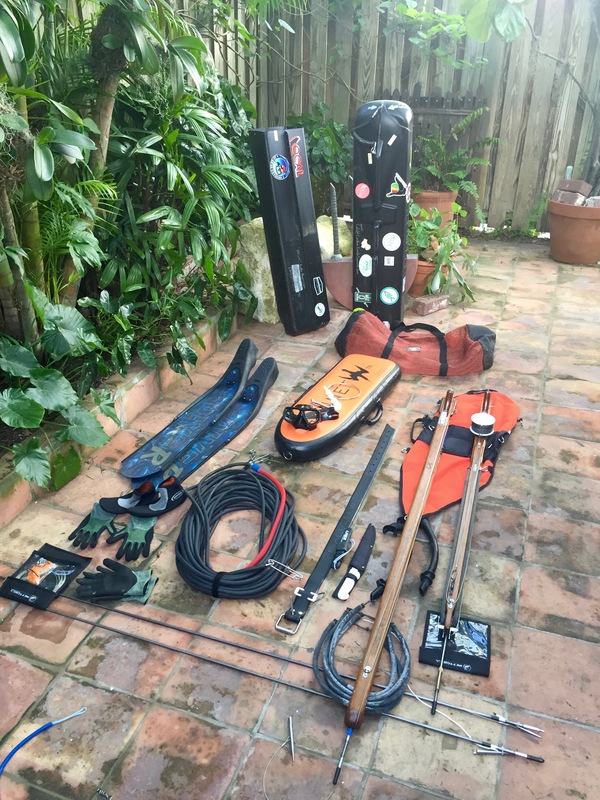 While away a category five hurricane named Irma developed and barreled down hurricane ally, the channel north of the Dominican Republic and Cuba, that leads straight to my home in Key West. Two days before the storm I made the decision to fly home to ride it out with my family and a few other crazy conchs. It was hard going but fortunately my family’s house and art gallery were spared. Most of the damage was in the Middle Keys who got the worst side of Irma. The storm surge and wind would make thousands of homes unlivable. Had the hurricane hit 20 miles west I would be writing a different story. After eight days without electricity, steady fresh water, and not much in the near future we cleaned up our island and helped each other out the most we could but the storm really put everyone in a funk. I managed to salvage some exotic hard woods that went down in the storm but friends losing houses, losing my power tools up the keys, and everything going on in the world had me feeling depressed. I had been talking to Capt. Keith Love with Texas Bluewater Safaris about possible dive days in the future and he told me he had a crew. I started to make calls to plan things out and things just seemed to fall into place. I’m a firm believer when things start to line up do not ignore them. I have a cousin that lives in New Orleans who had some wheels I could borrow and a place to rest my head. 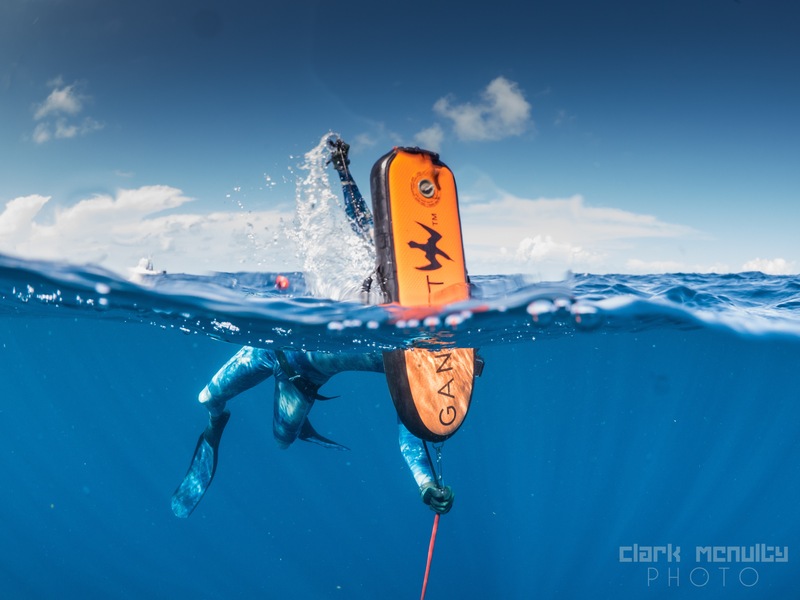 This type of diving also requires the right tools for the job, Patrick Nutt was nice enough to let me borrow his 67” Triple C Tuna Cannon that I built for him. I traveled by myself, which I am accustom to. As my plane flew above the blue tarped roofs into the Gulf of Mexico, I thought about all of the variables that come with Louisiana diving; tons of sharks, murky water from the Mississippi River, having the right gear, and having a Category one hurricane pass over them a week earlier. Leading up to dive day I honestly could not sleep, I had yellowfins swimming around in my head. Sometimes the bad things will try to enter your head, like all the things that can go wrong but what I have learned from playing sports is that you have to envision success. When a negative thought would go through my mind, I would make my mind rewrite the script and make it a positive one. I might have slept for an hour before my 3:30 am alarm rang and I sprung out of bed to start the drive south to meet the boat and crew. We loaded up the boat and it took a team effort to navigate out of the swamplands of the Mississippi River Delta. It was not going to be a walk in the park today, the swaying tall grass eventually turned into eight foot seas, but the water visibility was surprisingly good! Andy, Adam Beausoleil, Nolan Sadorf, Christian Somborn, Jason Bahiri, and I geared up and prepared to hop in behind a trawling shrimp boat. 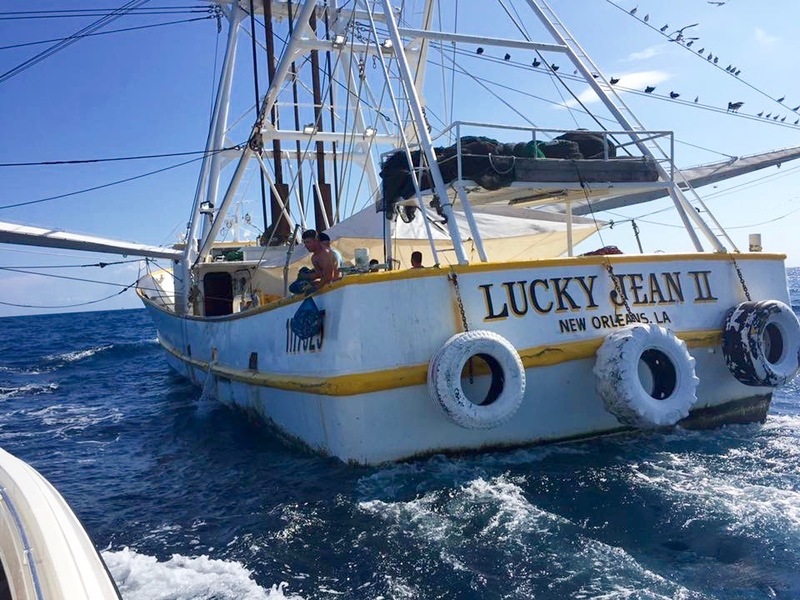 There is not much room for error as we pulled up to the stern of the shrimp boat while they towed their nets with one inch thick cable at a 45 degree angle behind them. Jason actually hopped on the boat to help sort the shrimp trash and bagged it up. 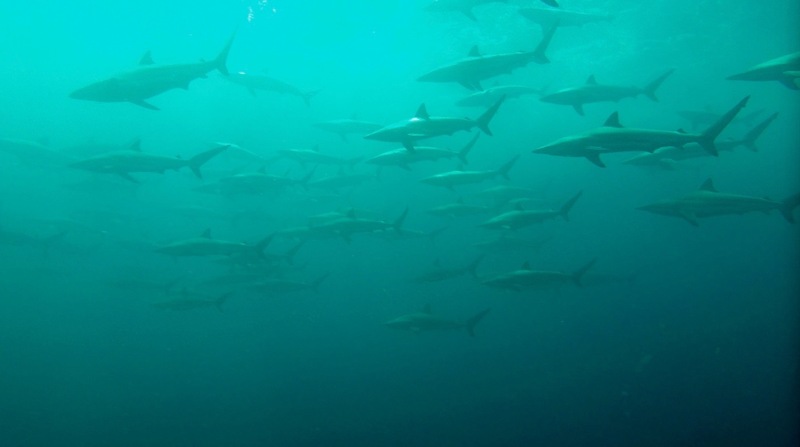 As you start to chum the bonitos, then the blackfin, and sharks boil on the surface eager for a free meal. This is where you get excited because somewhere down there under the whitewash is the fish you are after. 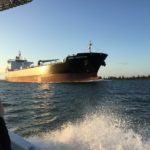 I took deep breaths to keep calm, with all my gear and two floats in hand I was ready to hit the water when the captain said it was time. Jason with our chum and some bonus shrimp! I hit the water and the prop wash from the shrimp boat blows me back. I could hear their powerful diesel engines in churning. I clear my mask and my gear then down into the madness. 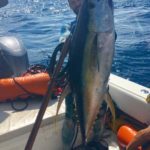 Silver bonitos dart everywhere with bigger blackfin tuna getting in the mix. 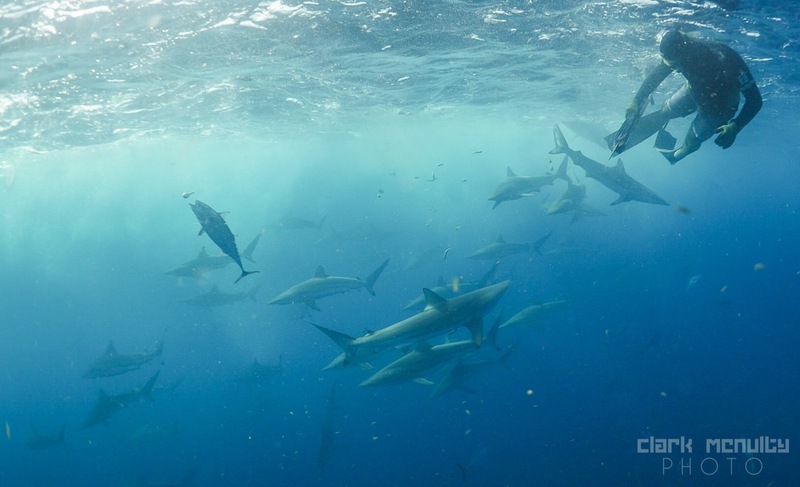 Not far behind the pointed snouts of silky sharks surrounded us—then a flash of black and yellow! You never know how many shark will be following any given boat, sometimes there are a few or few hundred and the same goes for the tuna. When surrounded by all this life you might see a dark large fish or a streak of yellow, it all happens very fast. Yellowfin tuna will be there then gone in seconds. 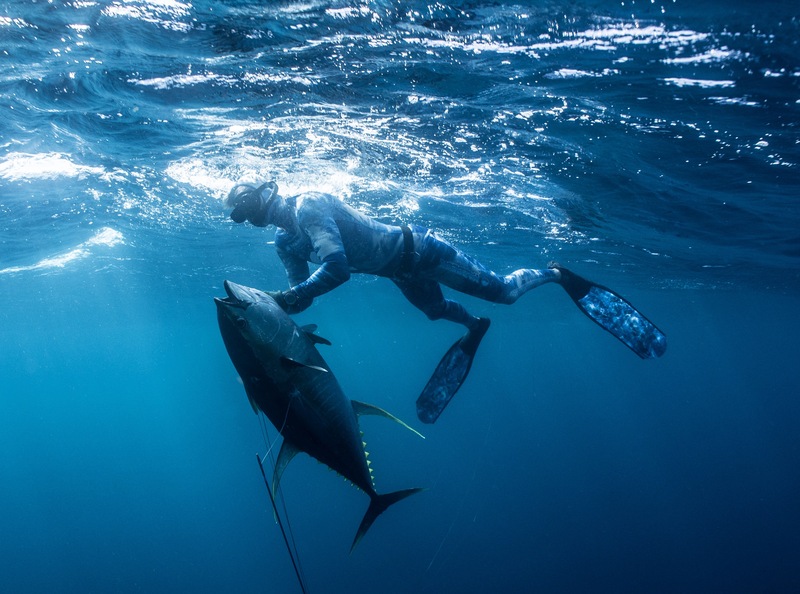 As soon as you hit the water you must dive and be ready to swing your large tuna gun with your slip tip on properly. To help you keep your cool in all the action around you, I’ll let you in on a trick that can be used in many situations and not just diving with hundreds of sharks. To help me explain, lets say you are attempting to sneak into a concert that you really want to see. You have to act like you belong there, acting nervous or suspicious will only get you in trouble. To help blend in you have to walk around like you own the place and this is true in diving. You have to act like the Alpha, any jerkiness or awkward movements will only draw the attention of the sharks and drive your fish away. I know it is easier said than done, but having that confidence can get you a long way. Act like you belong. After several attempts Christain was the last one in the water as Capt. Keith Love was watching the bottom machine and told us he was marking fish. Sure enough Christain popped his head up from a dive and calmly said “fish on.” Jason and I had just landed blackfin tunas but I eagerly geared back up with a smaller speargun to help him land his fish, once the yellowfin and it’s beautiful long sickles was in sight I dove to put a second shot in. 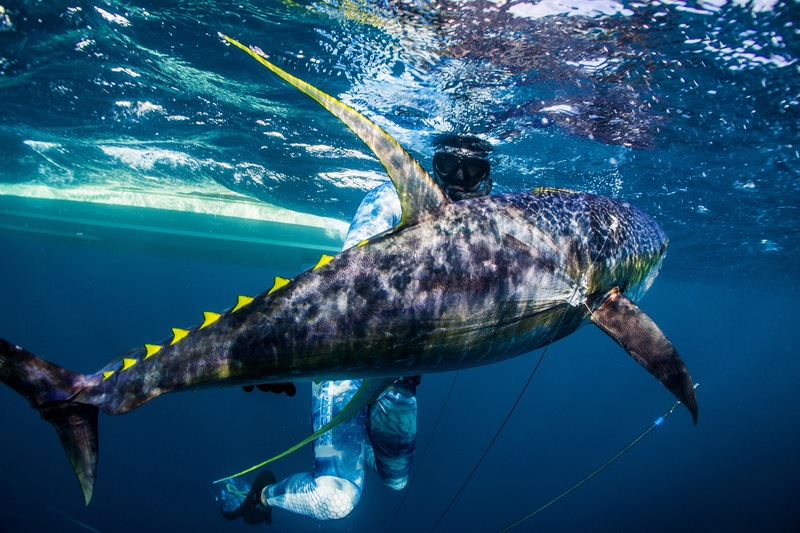 Now the tough part, wrangling a 120 pound tuna with two stainless steel shooting lines in the mix. Just when you think these fish are subdued, they can come back to life. We were reminded of that when Christian’s fish did exactly that right by the boat, shaking free and tail walked across the surface for 20 feet. Christian told us yellowfin tunas are named “Ahi” in Hawaii which means fire and yes, you must be careful when playing with fire after seeing that I could not respect these fish more. With the wind howling we drifted toward another shrimp boat, now with a 120 pound yellowfin on the deck. 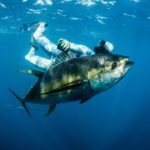 We were all were excited so we got into position one more time and hit the water, the bubbles cleared to reveal two large tuna with their long yellow sickle fins and perfectly symmetrical blue body swimming with ease through the water. 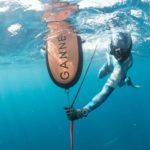 With one hand on the handle and the other halfway up my speargun, I turn, stretch, then pulled the trigger and the fish went for the depths, my Gannet Bluewater 50 float followed. I was not very confident in my quick shot with the fish swimming away, I cleared my second buoy from other lines as the fish ran hard. I was completely focused on the fish, working my Neptonics clutch to shorten the 100 foot bungie line when I could. My Gannet float looked like an orange tombstone above the water, but then the fish ran it would take the float down deep. During this time I took a peek to see where the boat was to call for a second gun, to my surprise there are two other orange floats sitting vertical close to me. 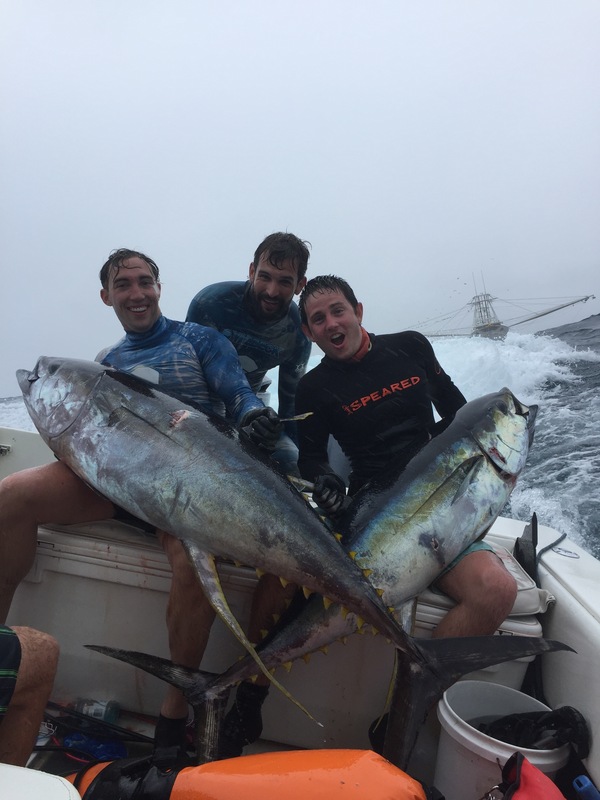 It took me a while to register what was going on but we had a yellowfin triple header on. The boat pulled up and tossed me my Triple C Rollergun, I clip in to my weight belt and kept fighting. It is amazing how far a 100 foot bungie could stretch. Neptonics says it will stretch up to 200% and I truly believe them. Once the fish was finally visible and was in range, the clutch held my progress and allowed me to catch my breath then dive back down. The second shot was well placed and put the fish down. I calmly pull the fish into arms reach then gently slid my hand into the gills after a knife. The fight was over, or so I thought. 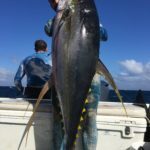 As a precaution I kept the fish pointed in the direction of the boat, any last kicks would propel me closer to the boat but there was none until I slid him through the boat’s tuna door. He still had some fight left as his powerful tail fin smacked me across my face giving me a fat bloody lip. A small price to pay for such a majestic fish. 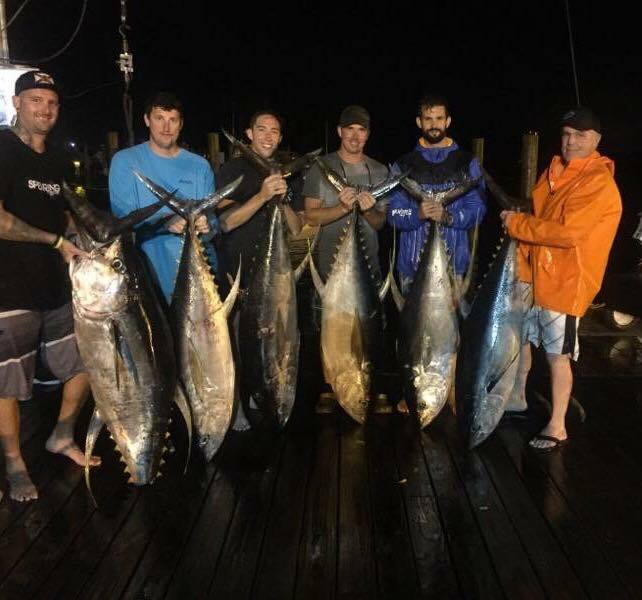 Jason and Adam would also land their first yellowfin after their own intense battle. It was one of those days where everything came together. After we landed those fish there was a storm on the horizon, our next drift would be the last of the day. We dropped Nolan and Andy in the bluest water we had seen yet. 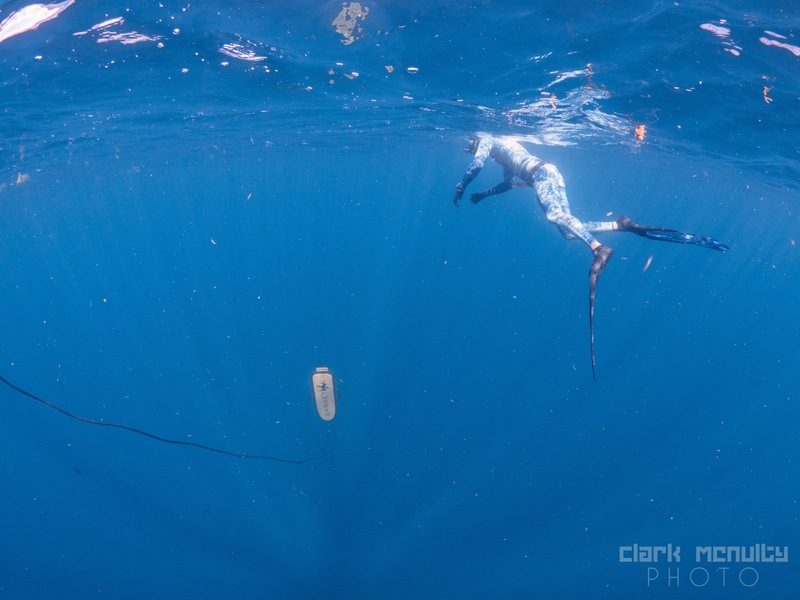 Nolan told us there were tuna from the surface before diving with my Triple C Speargun. Shortly after they were doubled up, both buoys rip through the water. The most excited I had been all day, I test my vocal cords then scramble to suit up to assist Andy with his fish. Andy had limited bluewater spearfishing experience but learned fast being an athlete and military trained. I attempt to talk him through the chaos but that last tuna worked us so hard my hands down to my feet were cramping. We eventually subdued the yellowfin together as a pair of hammerhead sharks came in to check out the action. I watched my favorite sharks in the distance their definition showed how clear the water really was. Not only did we all land a tuna, no fish were lost, we were all smiles during the cold rough ride in. At the filet table we all proudly filleted our tunas that all weighted over a 100 pounds. I promise you no meat went to waste, Drew Brees even got a slab. Big trips do not always end up as planned but when opportunities present themselves I encourage everyone to seize the moment.